A new study using MRI scans of the brain found that older people who regularly ate baked fish had less loss of brain cells as well as better performance on cognitive tests. While the research only shows an association between fish consumption and brain health, it is one of the first to take actual MRI measurements of brain volume and link it to the consumption of eating baked or broiled fish over the course of 10 years. "This kind of diet may have a protective effect (on the brain)," said Piero Antuono, a neurologist at Froedtert Hospital and the Medical College of Wisconsin who was not a part of the study. "It shows that these people (those who eat fish) are physically different." The study was presented Wednesday at the annual meeting of the Radiological Society of North America. The research involves 260 people with an average age of 71 who were cognitively normal at the start of the study. In 1989 and 1990 they were asked how much fish they ate and 10 years later underwent MRI scans of the brain as well as cognitive testing. The scans measured preservation of so-called gray matter, the brownish-gray tissue made up primarily of neurons, the main cells of the brain. The more gray matter in the brain, the healthier it is. Decreasing amounts of gray matter volume is a sign that neurons are shrinking. The study showed that people who ate baked fish at least once a week had greater amounts of gray matter volume in three key areas of the brain involved in memory and cognition: the hippocampus, the posterior cingulated and orbital frontal cortex. Those who ate fish had five times reduced risk of the risk of developing Alzheimer's disease or mild cognitive impairment over five years. "More fish gives you more brain and more brain reduces the risk of Alzheimer's disease," said lead author Cyrus Raji, a physician and researcher with the University of Pittsburgh School of Medicine. "Consuming baked or broiled fish promotes stronger neurons in the brain's gray matter by making them larger and healthier." Eating fried fish did not improve gray matter volume or reduce the risk of developing cognitive impairment. 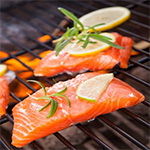 Antuono noted that baked fatty fish is rich in omega-3 fats, which may improve vascular health in the brain. He also said that DHA, one of the omega-3 fats in fish oil, is essential for the health of brain cell membranes. On the other hand, it could just be that people who regularly eat baked fish are less likely to eat unhealthy foods that can be damaging to the brain, he said. Raji acknowledged that his study only shows an association between eating fish and brain volume and that eating a lot of fish may be a marker for some other lifestyle measures that reduce Alzheimer's risk. In an attempt to rule that out, the study adjusted for a variety of factors such as education, race, obesity, physical activity and a gene known to increase Alzheimer's risk. Still, he said it was the first study to show a benefit from fish consumption using MRI scans. The issue of fish and omega-3 fats, which are found in high amounts in fatty saltwater fish, is an unsettled area of science. Numerous observational studies have showed a link between eating fish and reduced risk of cognitive decline. But clinical trials in which volunteers were given high doses of omega-3 fish oil generally have not showed a reduction in risk. The new study lends credence to the idea that the benefit from fish comes from eating just one or two servings a week, said Martha Clare Morris, a professor of nutrition and nutritional epidemiology at Rush University in Chicago who was not a part of the study. She noted that the clinical trials in which people were given high-dose fish oil capsules also allow them to eat up to three servings of fish a week. If the benefit comes from just a serving or two, that might explain why the clinical trials did not show a benefit, she said.